The disposal of used solar panels is a huge and growing problem that is not being sufficiently addressed, writes Michael Shellenberger, founder of the pro-nuclear citizens movement Environmental Progress (EP). He argues that a fee should be imposed on solar panels which should go into a fund to pay for recyling and clean-up. Since 2016, Sungevity, Beamreach, Verengo Solar, SunEdison, Yingli Green Energy, Solar World, and Sunivahave gone bankrupt. In other words, there are firms that may advertise themselves as “solar panel recyclers” but instead sell panels to secondary markets in nations with less developed waste disposal systems. In the past, communities living near electronic waste dumps in Ghana, Nigeria, Vietnam, Bangladesh, Pakistan, and India have been primary e-waste destinations. Perhaps the biggest problem with solar panel waste is that there is so much of it, and that’s not going to change any time soon, for a basic physical reason: sunlight is dilute and diffuse and thus require large collectors to capture and convert the sun’s rays into electricity. 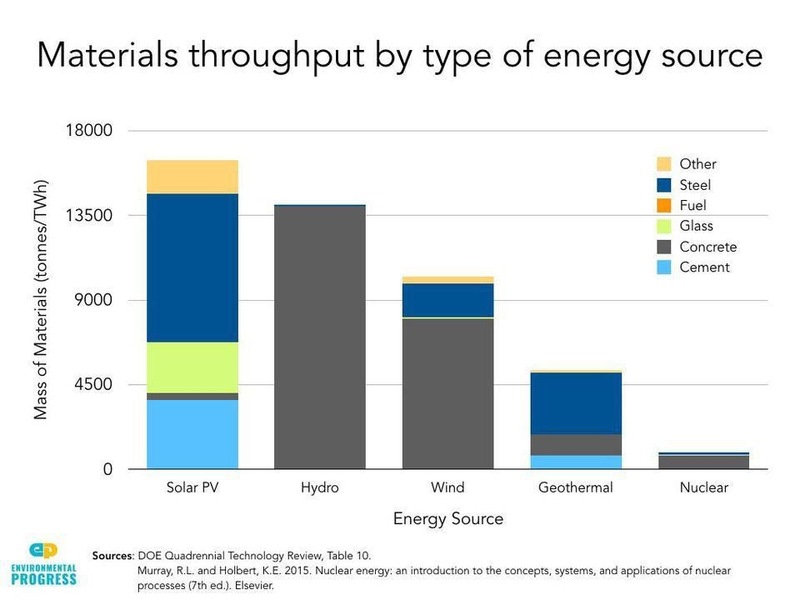 Those large surface areas, in turn, require an order of magnitude more in materials — whether today’s toxic combination of glass, heavy metals, and rare earth elements, or some new material in the future — than other energy sources. All of that waste creates a large quantity of material to track, which in turn requires coordinated, overlapping, and different responses at the international, national, state, and local levels. The first step is a fee on solar panel purchases to make sure that the cost of safely removing, recycling or storing solar panel waste is internalized into the price of solar panels and not externalized onto future taxpayers. An obvious solution would be to impose a new fee on solar panels that would go into a federal disposal and decommissioning fund. The funds would then, in the future, be dispensed to state and local governments to pay for the removal and recycling or long-term storage of solar panel waste. The advantage of this fund over extended producer responsibility is that it would insure that solar panels are safely decommissioned, recycled, or stored over the long-term, even after solar manufacturers go bankrupt. Second, the federal government should encourage citizen enforcement of laws to decommission, store, or recycle solar panels so that they do not end up in landfills. Currently, citizens have the right to file lawsuits against government agencies and corporations to force them to abide by various environmental laws, including ones that protect the public from toxic waste. Solar should be no different. Given the decentralized nature of solar energy production, and lack of technical expertise at the local level, it is especially important that the whole society be involved in protecting itself from exposure to dangerous toxins. None of this will come quickly, or easily, and some solar industry executives will resist internalizing the cost of safely storing, or recycling, solar panel waste, perhaps for understandable reasons. They will rightly note that there are other kinds of electronic waste in the world. But it is notable that some new forms of electronic waste, namely smartphones like the iPhone, have in many cases replaced things like stereo systems, GPS devices, and alarm clocks and thus reduced their contribution to the e-waste stream. And no other electronics industry makes being “clean” its main selling point. If the industry responds with foresight, Mulvaney notes, it could end up sparking clean innovation including “developing PV modules without hazardous inputs and recycled rare metals.” And that’s something everyone can get powered up about. Michael Shellenberger (@ShellenbergerMD) is founder of the pro-nuclear citizens movement Environmental Progress (EP). Michael is (co-)author of many books and essays including The Death of Environmentalism, Break Through, An Ecomodernist Manifesto, Evolve, and Love Your Monsters. He writes for publications including Scientific American, The New York Times, and the Washington Post. A big mix of techologies ourd in a big pot, and then the voulmes of one tecnologie mixed up with substances of other technologies, and parts of materials used for nuclear mixed up with more than complete masses for solar and so on. Lets look if the cited masses are reasonable. there should be a use of 15.000t / TWh for solar power, fo this roughly 6000t of steel. 1Twh is produced by solar power with 1500kWh/yer*kWp – lower than desert, higher than at the poles, so easy to calculate, roughly average – in 30 years by 22MWp of solar. 22MWp should require 6000t of steel? this would be 6t of steel – 6000kg – to mount 22kWp or 66 Modules, so roughly 100kg of steel per module. Along with 3000t of cement (for what is the cement used? Neither roof mounted solar modules, nor greund monted modules use cement today or in the last years – maybe it’s the building below roof mounted solar? While nuclear needs exacly no uranium ore to run as it seems acording to the data. Glass also seems by factor 2-3 too high. The data -i find tells that it needs about 30t of yellowcake (80% Uranium) per TWh produced. Cince Uranium Ore contains about 0,15% uranium, about 18000t of uranum ore must be processed, to collect this a lot more material must be moved around. Aluminum, silicon dioxyde, and iron ore, which are the main compolnets of standard solar panels, are usually used when they are naturally concentrated above 80%. Only the copper and the silver, used in much smaller amounts in solar panels are made from ores with lower concentration. Silver is used – according o numbers of Heraeus, which i found, with around 10mg/W, so the 22 MW contain 22.000.000*0,01g=220.000g or 220kg, of which most can be recyceled after use. Silver can be replaced by copper or Aluminum if costs for silver rise (if it becomes rare), copper can be replaced by Aluminum if it becomes rare. Aluminum and silicon dioxyde are available in practically infinite amounts. By the way, solar modules within the EU are never disposed into the field but always recyceled due to EU regulations. I once again looked at the DOE Quadrennial Technology Review. There is a table about water consumption, just after the material needed for power plant construction. It is about 750 gallon/MWh for nuclear energy a.k.a. 2.78 Mt/TWh of water consumption. PV needs about 100 gallon/MWh (material processing before construction), wind power next to nothing. – Coal plant needs 800k to 1000k tons of coal per TWh. And also, I don’t know original assumptions of authors of those numbers (irradiation, capacity factors, wind speed, lifetime of power plants, …). Number may vary A LOT. – The article also contains logical fallacies, f.e. the cadmium. It is used just in a small fraction of PV panels (<10%). Author writes the article as the cadmium would be problem of all panels. Also, where are rare earth elements in PV panels? Same fallacy with electronic waste. Conclusion: Wind and PV power waste is several orders of magnitude smaller problem than waste and pollution from fossil fueled power plants. It is technically possible to reduce this problem to next-to-nothing and it would cost a trinket. The nuclear power waste (both fuel and plants) is still a problem to be solved. So how come used solar panels are not re-processed, but dumped? And could we have some numbers supporting your assertions on waste treatment cost? Sure, I come from the country where we areály pak recyclation fee when buying PV panels. It is 8.5 CZK per kg. 300W panel weights 18 kg and 1 EUR=25 CZK. Recyclation fee adds cost 0.02 EUR/W, a trinket. But thé recyclation companies are fighting to get into this business like crazy. It is certainly a bargain. You disregard the author’s referenced figures due to their age. Do you have a source for more recent figures relating to solar resource use? Also you make a pretty sweeping claim: ‘it is technically possible to reduce this problem to next-to-nothing, and would cost a trinket’ – care to elaborate? Extensive time and money has and is being spent by many IAEA nations in designing not only geological storage faciltiies – which can be accurately predicted to safely store (without leeching) the highest activity waste for periods of time far eclipsing the history of humanity – as well as other near surface facilities for the extremely conservatively classified mid to low level waste. Is it always going to be guilty until proven innocent for nuclear with respect to waste management? I think it is allowed to swith on the brain instead of requiring references to other documents. When in practice nobody uses concrete to install solar modules on roofs or open fields, Data which shows piles of concrete per kWp installed is most likely obsolete for any use. By the way in europe the price for recycling solar modules are alredy included in the sales price:https://www.elektrogesetz.de/themen/photovoltaik-pv/ with negible effect on the price, because the reused materials pay at least the mayor part of the recycling. nuclear has the problem that no finalised deposition cycle could be tested anywhere yet – it simply takes too long. While recykling of matrerials for wind or solar power can be shown in practice, als how to transform (burn) parts which are not worth recycling to materials which are non toxic and already existing in the environment without causing harm. So all solar panels or bad because some contain hazardous materials? If you have a problem with CdTe solar panels , rally against those, instead of throwing them on one heap with benign silicon-based models which form the majority off the market. Maybe, Mr. Shellenberger could clarify which rare earth metals are used in which kind of PV- panels. Because to my best knowledge there are only some experimental solar cell types that are not yet out of the laboratory that contain a minute amount of rare earth metals. Solar power in India received the much-needed boost through the Jawaharlal Nehru National Solar Mission (JNNSM) in 2010. It is safe to assume that the majority of solar installations in the country were set up after that and the end of life for already-operating solar panels would happen after 2035. This is one of the reasons why no one is thinking about what will happen to solar panels once they are not able to generate power. The question is how will India dispose 100 gigawatt (GW) worth of solar panels in the next 20 years? Assuming that an average panel is sized 250 watt, 100 GW will amount to almost 7.76 million tonnes of e-waste (77.6 lakh tonnes to be exact) at the end of a lifetime (25 years) of a solar plant. There is no mandate in the rules which the MNRE is referring to in respect to solar PV specifically at the moment. It’s amazing reading through all comments, which are rather focused on defending the solar industry and discrediting the nuclear one than accepting the fact of a real existing hazardous waste which is nowhere regulated and nowhere under control. It’s just about admitting that Solar has this kind of a real problem and needs to be solved and openly discussed, and that Nuclear is less problematic than actually politicized and polemically disseminated because new technology such as fast neutron reactors and related research will solve the nuclear waste issue by recycling and re-use. Keep your mind open. b) hazadorus material is only included in a special kind of modul, which is not the kind of module which is commonly used? And why should we ignore the well known and multiple times bigger waste problems of nuclear? Germany is still spending billions of Euros on cleaning up the mess left over from uranium mining, and that’s just the less problematic mining part. Decomissioning of each nuclear plant is a buillion Euro procect, and keeping care of the wastes is a near infinite lasting drain of money in the future. Keeping care of all the problems of nuclear power generation is simply too expensive. Which causes some nuclear fanboys to create ristks for renewable power production which do not exist in practice. As simple as that. Germany is still struggling with the compensation of closing nuclear plants by coal fired power plants. Going 100% for renewables in Germany will take a very long time and looks not to be very realistic at this stage of the process. Fact i that germany is phasing out coal at lower speed because it phases out nuclear at faster speed. Germany decided to phase out cholea before typhus, the author of this blog asks the rightful question if phasing out typhus before cholera would not have been a better decision. Some people would prefere to spread cholera further so people will not get typhus. […..]every few weeks another coal block in germany is closnig down, and there are no new oes comming past them (Datteln IV as a exception, which is almost 10 years late and might never start up) Last closure notice was from Wuppertal Elberfeld. There is zero chance that hard coal will survive current market coditions for a longer time. Thermal coal in Australia is at 120$/t, just to get it in the ship in the harbour. To get it in a power staion in germany rises this cost roughly to 120€/t. For about 8MWh thermal. With 40% netto efficiency of the plant this is 3,2 MWh electric for sale. Or 37,5€/MWh for coal alone. With 16€/t for emission rights and 0,8kg/kWh roughly as emissions, this is another 12,8€/MWh. So short time variable prices for hard coal power is >50€MWh for existing plants, and with money for employees, and some repairs it is well above 60€MWh. New renewable is tenderd below 50€/MWh, new solar below 40€/MWh. So hard coal leaves the market, gettng less and less full load hours where prices are above 60€/MWh which are needed to survive in short to mid range. I don’t know where you found your power generation numbers, but there are more factors to be considered when seriously comparing one type of energy versus another type. You have to consider the whole value chain up to the price that the end-client pays. In regard to the solar power costs of 40€/MWh, the end user costs paid by the private customer to the grid are exceeding now €304/MWh. thus 62% less than in Germany. Main reason: over 60% of the electric energy is produced by nuclear power and green energy is also heavily subsidized. Subsidizing green and especially solar energy costs the tax payer (all of us) a bunch of money. But this is a subject that nobody really wants to touch. But again it is a fact. …and unfortunately the solar cell and module waste remains still a big unsolved issue. Whatever you may come up again as arguments…. I’m sorry, but at this stage of time, you just have to accept an unsolved solar modules recycling issue. Thanks for writing such kind of important article. Actually, Solar panels may be an appealing choice for clean energy, but they harbor their share of toxic chemicals. The toxic chemicals are a problem at the beginning of a solar panel’s life — during its construction — and at the end of its life when it is disposed of. These two intervals are times when the toxic chemicals can enter into the environment. Thanks Sungold Solar for your contribution to this critical issue. My questions are: what has been done so far for mitigating this environmental risk? Are the users and subsidizing organizations aware of this issue? If yes, what do they intend to do? If not, then we might have a serious problem.